Oops - we don't appear to have a video for the Scanjet Pro 2500 f1. I have only had this scanner running for about 6 days, but I'm very pleased with it so far. I'm not using it for a business, but to scan about 32 linear feet of material that I have acquired from various archives over the years in order to downsize, and get rid of 4 or more filing cabinets. The sheet feeder is a boon, and has coped well even with different sizes of paper in the same batch. It has also scanned very light paper, from the Sunday Times colour supplement, without jamming. Scanning to image pdf is at about 20 pages per minute at 300dpi, and it scans double-sided pages in a single pass (making 40 images per minute possible). I found loading the software a bit tricky, but may have auto-run disabled. The accuracy of the 'pure' pdf in OCR depends on the quality of the original. It can be virtually 100 % accurate. I'm glad I bought this model. Enhance productivity for routine scanning tasks with a full-featured HP Scanjet Pro. Automate your workflow with fast,two-sided scanning,an extensive automatic document feeder (ADF) for unattended scans,multi-page daily duty cycle,and one-button shortcuts. You can even capture and edit text. Designed for the desktop,this HP Scanjet Pro fits where you need it. Does your busy office need the flexibility to scan not only a stack of documents,but also pages from a book? Do you need to quickly scan documents,while trusting that they are being properly captured,processed with optical character recognition (OCR) and routed? 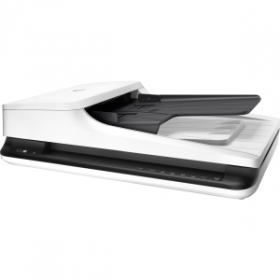 The HP Scanjet Pro 2500 f1 is ideal for small and medium businesses that want versatile,full-featured scanning for quick,ad-hoc tasks and routine mid-volume jobs. Simplify day-to-day scanning with this compact and affordable scanner. You can automate workflows and turn paper into meaningful data that's properly structured and archived.